Seating areas often serve divergent needs and purposes. They must be designed with a view to sizing them appropriately with the group who will be using them. Some are intended where people and groups cluster, others for no more than a few individuals. There is no more magical seating area than around the magnetic power of fire. When the air is cooler, people love to look at a fire and take in its mesmeric powers and warmth radiating around it. From the more formal fire places to the less informal fire pits, both of these areas are great gathering spots for people to congregate, enjoy the radiance while having a drink and socializing and afford opportunities galore for night conviviality. 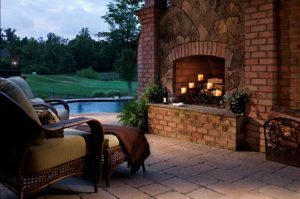 The design professionals at IVY Studio, a landscape design and build consulting firm in the metro Boston region have loads of experience designing and planning your next outdoor expansion project featuring a fire place or fire pit for gathering and enjoyment. Contact us at 781-591-0300 or vern@ivystudioMA.com to engage into a discussion that will add warmth to your outdoor entertaining spaces.